Mundane mayhem isn't usually our fancy until it involves an organized, $1 million crime ring of waiters and waitresses in New York City's best (more on that later) steakhouses or someone stealing Marc Jacobs's entire spring collection. The alleged scam targeted customers who often paid with American Express Black cards and other high-limit credit cards, according to sources. Law enforcement sources said some restaurant workers used handheld scanners to copy the credit card information as they walked away to process the bill. Later, that information would be sent to leaders of the alleged fraud ring, who would forge new credit cards with the stolen information and test them out on taxis. If the cards worked, the suspects would go on major shopping sprees, buying up expensive goods like Chanel goods and Jimmy Choo shoes. The thieves would then re-sell the luxury brand items for cash. Marc Jacobs's Spring Collection; $63,000: Marc Jacobs's Spring 2012 collection is missing. Gone. Stolen. Lost. And not like in the way that samples are sent out to fashion magazines only to be "delayed" or "being sent back shortly." This forced the designer to cancel his press day. The Wall Street Journal noted Jacobs's hasn't been the only designer ransacked by thieves, as designers Alexander McQueen and Christopher Kane were raided in recent years. And they also mention a Donna Karan spokesperson who passed along condolences for the stolen collection and perhaps a bit of (unintended?) one-upmanship), "Omg JUST now saw.. AWFUL. We had about 60 pieces stolen last prefall too." 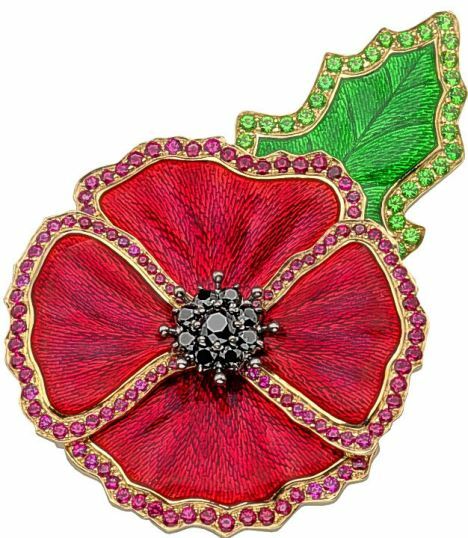 A Jewel Encrusted Poppy; $40,000 (estimated): It's tradition for Brits to wear a poppy on Remembrance Day, or 11/11/11 this year. Most Brits opt for the paper poppy, not one that's encrusted with rubies, 18 karat yellow gold and a cluster of black diamonds. "'The theft occurred at 7a.m. on Saturday during which a handbag containing a 'Garrard' ruby and diamond brooch was stolen at the Copthorne Tara Hotel," reports The Daily Mail. There's a £5,000 pound reward for, I guess, someone who spots whoever is wearing that really gaudy, expensive-looking poppy. A $15,000 Spider Man collector's edition comic book is missing from a Lincoln home. The issue went missing between Oct. 27 and Monday morning, the owner told police. The man said he had it with other comic books, but several people had been in and out of the house since he last saw it. Amazing Fantasy No. 15 is the first comic to feature Spidey and sold at 12 cents in 1962.